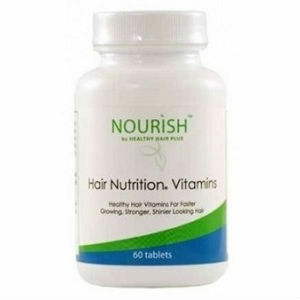 This is a review of Healthy Hair Plus’ Hair Nutrition Vitamins®. They claim to promote growth of natural, healthy hair. They also claim to improve the length, quality, and density of your hair, in addition to aiding new growth in areas suffering from hair loss. Healthy Hair Plus also suggests that their Hair Nutrition Vitamins® can stave off the loss of hair color that comes with age. Read on to find out more about this supplement & find out if it’s the right product for you. From what we could find on the manufacturer’s web site, it is suggested that you take 1-2 pills a day, with a meal. They further suggest that, in order to see the full effectiveness of their Hair Nutrition Vitamins®, individuals should take them for no less than 3 months. It is not recommended to take this supplement within one hour of taking any medications, nor is it suggested that individuals exceed the recommended dosage. Mothers (either pregnant with child, or nursing), as well as individuals under the age of 18 should consult with a physician before using any vitamin supplement. From what we could glean from the company’s site, it seems that Healthy Hair Plus’ Hair Nutrition Vitamins® may not actually have high enough levels of their active ingredients (most notably Biotin) to have a noticeable impact on the human body. Of course, variation from individual to individual may play a role in the vitamin’s effectiveness. One bottle of Healthy Hair Plus’ Hair Nutrition Vitamins® costs $12.99, and contains 60 pills, enough for between 1 to 2 month’s supply. There are no discounts available through Healthy Hair Plus’ web site (save for a shipping discount on orders over $75), nor are there any sort of subscriptions available for additional savings. As the price is rather low, this product presents a very low-cost solution for hair loss. Healthy Hair Plus advertises a full refund within 30 days of receiving your supplement, sans the cost of shipping. Plenty of customer reviews could be located on the company’s site, and they varied between 3/5 stars to 5/5 stars. It should be noted that returning customers are given the chance to fill out a customer review in exchange for 15% off of their next purchase. Because of this apparent conflict of interest, we advise caution when reading the posted reviews. Healthy Hair Plus’ Hair Nutrition Vitamins® seems to be a fairly standard product. They offer their vitamins at an incredibly cheap price. Unfortunately, they don’t quite measure up to many of their competitors as far as the levels of active ingredients are concerned. Customer reviews were mostly positive, but cannot be trusted, as the company offers discounts to those who post those reviews. Also worrisome is the completely inability to find nutrition facts or detailed instructions for use of these vitamins on the company’s site. John Brownstone	reviewed Healthy Hair Plus Hair Nutrition Vitamins	on June 28th	 and gave it a rating of 3.5.